Now we are ready to write the client application. There are two key aspects to taking full advantage of VoltDB in your client applications. One is make connections to all nodes on the cluster, which we will discuss shortly. The other is to use asynchronous stored procedure calls. You can call VoltDB stored procedures either synchronously or asynchronously. When you call a stored procedure synchronously, your client application waits for the call to be processed before continuing. If you call a procedure asynchronously, your application continues processing once the call has been initiated. Once the procedure is complete, your application is notified through a callback procedure. Synchronous calls are easy to understand because all processing is linear; your application waits for the query results. However, after VoltDB processes a transaction — between when VoltDB sends back the results, your application handles the results, initiates a new procedure call, and the call reaches the VoltDB server — the VoltDB database has no work to do (assuming there is only one client application). In this situation whether the stored procedures are single- or multi-partitioned doesn't matter, since you are only ever asking the cluster to process one procedure at a time. 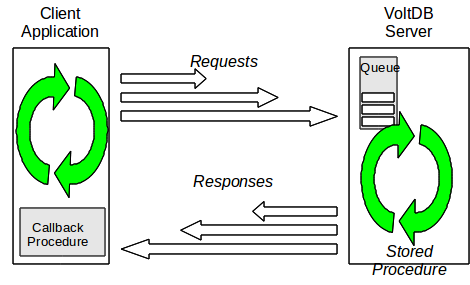 As shown in Figure 2.1, “Synchronous Procedure Calls”, more time can be spent in the round trip between transactions (shown in yellow) than in processing the stored procedures themselves. What you would like to do is queue up as much work (i.e. transactions) as possible so the database always has work to do as soon as each transaction is complete. This is what asynchronous stored procedure calls do. As soon as an asynchronous call is initiated, your application continues processing, including making additional asynchronous calls. These calls are queued up on the servers and processed in the order they are received. Once a stored procedure is processed, the results are returned to the calling application and the next queued transaction started. 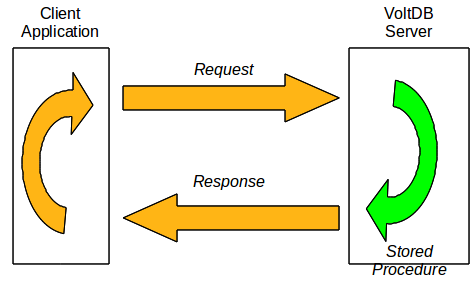 As Figure 2.2, “Asynchronous Procedure Calls” shows, the database does not need to wait for the next procedure request, it simply takes the next entry off the queue as soon as the current procedure is complete. For asynchronous procedures calls, you must provide a callback procedure that is invoked when the requested transaction is complete. Your callback procedure notifies the client application that the call is complete and performs the same logic your client application normally performs following a procedure call: interpreting the results of the procedure (if any) and making appropriate changes to client application variables. // Make sure the procedure succeeded. The following notes describe the individual components of the callback procedure. You define the callback procedure as a class that implements (and overrides) the VoltDB ProcedureCallback class. Whereas a synchronous procedure call returns the ClientResponse as a return value, an asynchronous call returns the same ClientResponse object as a parameter to the callback procedure. In the body of the callback, first we check to make sure the procedure completed successfully. (If the procedure fails for any reason, for example if a SQL query generates a constraint violation, the ClientResponse contains information about the failure.) In this case we are only looking for success. Once we know the procedure succeeded, we perform the same functions we would for a synchronous call. In this case, we retrieve the appropriate words from the response and use them to construct and display a greeting to the user. Once you define a callback, you are ready to initiate the procedure call. You make asynchronous procedure calls in the same way you make synchronous procedure calls. The only differences are that you specify the callback procedure as the first argument to the callProcedure method and you do not need to make an assignment to a client response, since the response is sent as a parameter to the callback procedure.